If you manage an office or own a business, consider adding artificial grass to your property. Doing so is a budget-friendly way to impress clients and boost workers’ moods. It’s not easy to achieve these goals with live grass due to high upkeep costs. Artificial grass requires almost no lawn care. You don’t need to water, mow, or seed it. It also comes in a wide range of colors and styles. With artificial grass, you can install a lawn that matches your exact goals. We at Watersavers Turf are always happy to offer ideas and tips to help. Keep in mind that these types of products don’t just mimic grass anymore. We also offer artificial boxwood panels along with our turf. These give you the option to install greenery on your walls too. Running a business requires making sure your lawn has curb appeal. An unhealthy lawn drives away guests and sends the wrong message to clients. Synthetic turf always looks bright, green, and healthy. It’s the best option for improving the look of your yard and offices. Keeping a grass lawn healthy involves constant lawn care. You may not have the time or money for that kind of upkeep. Synthetic turf is different. After you install synthetic turf, you barely need to maintain it. That’s why it’s a better choice for your needs. It mirrors the look of robust, healthy grass. Guests will notice it right away, making your property more inviting. Because you’ll save time and money on upkeep, you can use those funds for other projects. Fake grass is also useful when it comes to keeping your staff happy at work. Studies show that green spaces and images of nature offer a major mental boost. They also prove that it doesn’t even need to be real. Science gives us good reason to believe that fake grass will offer the same benefits as real grass. Want your workers to perform their best throughout the day? Install a fake grass or boxwood wall area where they can relax in during breaks. The research shows that people feel calmer after looking at scenes of nature. This is vital in an office setting. Most jobs get stressful from time to time. Sadly, when people are stressed, they don’t perform at peak levels. Prolonged stress may even cause some workers to quit. At the very least, it ensures that they won’t do their jobs to the best of their abilities. You should take any steps you can to make your office more peaceful. Installing these types of products is an easy one. Doing so will lead to happy workers and increased productivity. It’s not possible to calculate the full value of those results. They could mean the difference between failure or success. All good business owners know about the need for strong branding. Artificial turf and boxwood panels can help ensure your commercial property reflects your brand. With artificial turf and artificial boxwood panels, you can transform the look of your building, inside and outside. Instead of making it feel like a bland, generic space, you’ll show that your company is lively, bright, and detail-oriented. You could hire a landscaping company to help achieve these goals, but that’s the kind of expense that’s tough for a business owner to justify. Installing artificial turf or boxwood ivy panels is the smarter option. Since these products don’t need to be watered, they’re an environmentally-friendly way to bring life and energy to the inside or outside of your building. Using these products adds a layer of social responsibility to your brand that resonates with many potential customers. Keep in mind that many young businesses realize that customers appreciate companies that embody socially-conscious values. 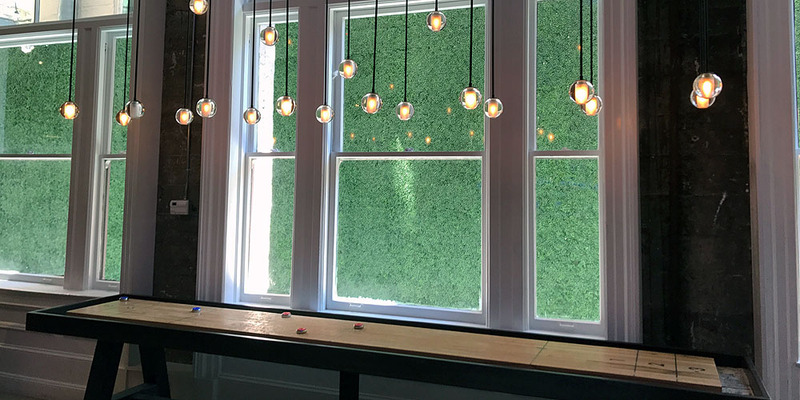 They look for businesses that attempt to “go green.” For example, we just installed boxwood ivy panels at the Zeppelin hotel in San Francisco (see the image above). Guests in their game room can look out the windows to the back patio and see a wall of beautiful ivy instead of a wall of concrete. If you run an office, a faux lawn offers many practical benefits. Again, it reduces lawn care costs by a huge margin. A faux lawn is also durable. It stays in great shape for years, even after harsh weather. With a faux lawn, your workers and guests won’t have to put up with a sloppy, muddy yard after heavy rainfall. It also makes it easy to install a lawn that matches your exact vision. You probably have a good idea of what the green spaces on your property should look like. You also probably know that realizing those visions is challenging with live grass. As such, you’re likely to abandon your plans. You have more pressing matters to focus on when you run a business. That doesn’t need to be the case. Using these products lets you tailor your office space to your precise desires with ease. Plastic grass isn’t just useful in an office setting. It’s an ideal surface option for many types of properties. For instance, hotel owners use plastic grass to offer guests relaxing outdoor lounge areas that cost very little to maintain. Retail shops boost their curb appeal with it. Plastic grass adds character to outdoor eating spaces. No matter what kind of business you run, you want your property to look its best. This isn’t a minor issue. People have immediate reactions to the look of an office, store, hotel, or any other business. If the yard is bright and green, they’ll feel better during visits. If it’s unhealthy and damaged, they’ll assume the business owner doesn’t pay attention to the little details. It’s time to transform your office space. Watersavers Turf will help. Have any questions? Call us toll-free at 844-974-8873. We’ll be happy to address any and all of your concerns. We also offer free estimates online. Our turf comes in over 60 different styles. It’s essential to find the right one for your goals. We help by offering free 1’ x 1’ samples. Stop by any of our SF Bay Area locations to pick yours up. Looking for a contractor to install your turf? We’ll refer one. For contractors who want to learn how to install our products, we even offer free classes on the subject. We don’t just aim to supply quality turf—we also want to provide top-quality service.